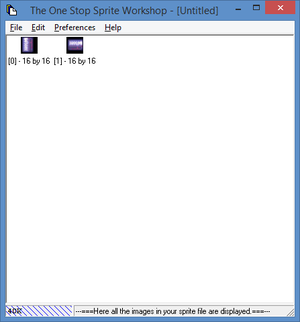 A sprite for a COB as displayed in Sprite Workshop - note it has two images contained in the one sprite set. A sprite is an image used in games from the Creatures series which, in a sprite set, can be the images for a breed of Creatures, or be part of a COB or Agent, or even be part of the world in which your Creatures live. A sprite set is a collection of sprites used together to create the image of the norn/grendel/ettin/geat or agent/COB. 1 Where can I find my sprites? 2 Which sprites are which? Where can I find my sprites? You will notice that most sprites have a relatively cryptic name, such as a02d.c16 for the head image for male child breed-slot d (chichi) Norn. The first character refers to which part of the body it is, the second character is the species and gender, the third character is the life stage of the creature, and the forth character is the breed slot. Note, in Creatures 1, breed slots were numbered 0-9, so a sprite name could be a029.spr, but in later games they were lettered a-z. Grab a dedicated graphics program, like MS Paint, or another program. Draw an image into it, keeping in mind the limitations of the palette (if spriting for C1). For all games, pure black (Hex: #000000) appears transparent in-game. All frames of the same object must be the same size: just fill in the blank space with pure black. Try to keep the blank space to a minimum, though: don't have your object in a vast sea of darkness or it will be larger than you think when you get your object in-game. Save your images in PNG (if you are going to import them into Edos), or 24 bit BMP format (if using SpriteBuilder or the Sprite Workshop). This page was last modified on 29 March 2019, at 04:13.